Besides the general duty imposed upon us by the divine law of charity, there is a special obligation incumbent upon everyone to assist particular souls. This duty devolves upon us in consequence of the personal relations with such souls during their earthly career; for, whatever be the condition of man in life, he will have among the souls, departed, who may be suffering in Purgatory, some to whom he is indebted for particular favors and benefits. But what could more forcibly elicit our charity and gratitude than to behold our loved ones and our benefactors in extreme distress, while we have the means of alleviating their sufferings! That person does not possess a spark of Christian charity, who, from neglect or indolence, suffers the souls of his friends to be tormented in the flames of Purgatory. Prayer. Revive, O Lord, within the hearts of Thy faithful, an active commiseration for the brethren gone before us, that they may not, by our indifference or neglect, suffer without relief and assistance. Through Christ, our Lord. Amen. 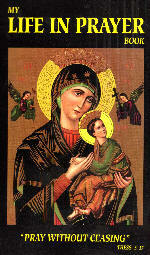 Special Intercession Pray for the souls of those who are neglected by their relatives and friends. Practice Bestow alms for the relief of suffering souls.